Grammar schools in England say they would oppose changes to the rules on parental ballots about selection. There have been claims that a report from MPs will say it should be easier for parents to hold ballots on grammar school status. So far there has only ever been one local ballot on whether a school should remain a grammar school. Opponents of selection have argued that the ballot system is too complex and weighted in favour of grammar schools. The National Grammar Schools Association says it would be very concerned if MPs sought changes to the ballot regulations over the status of the 164 remaining grammar schools in England. There have been reports that the education select committee, in a report on secondary school admissions, will call for changes to make it less difficult for parents wanting to stop selection by ability. To change a grammar school into a non-selective school, there is a two-stage process - beginning with a petition for a ballot, which requires the signatures of a fifth of local parents. Once this has been achieved there is then a vote among eligible parents. There has been only one ballot - four years ago over Ripon Grammar School. Parents there voted to keep selection - and campaigners against the 11-plus say the ballot system works in favour of this. For ballots over a single grammar school (rather than a whole area), eligibility to vote and sign the petition is based on parents of children at schools which send five or more pupils to the grammar school. 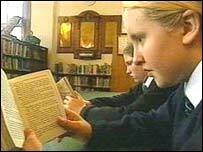 These rules about what constitutes a "feeder" school have been disputed - as it can mean that parents of private prep schools can vote, while parents in nearby state schools, which have no tradition of sending pupils to a grammar school, are excluded. And reports have claimed that the education select committee will call for changes to make more parents eligible to take part. For ballots in areas which are fully selective, such as Buckinghamshire, there is another set of rules for eligibility, intended to cover all the families who might be affected. Getting 20% of these parents to sign a ballot petition has proved difficult for anti-grammar campaigners - and several efforts to gather names have fizzled out. Stan Danks, secretary of the National Grammar Schools Association, said the regulations had been a "bulwark" in maintaining grammar schools - and there was no reason for the system to be altered. The current system was "extremely fair," he said. Mr Danks said attempts to change the rules were motivated by ideological opposition to grammar schools - and they put at risk the achievements of these high-performing schools. "Ideology always gets in the way of common sense," he said. The government should abide by the principle of "if it ain't broke, don't fix it". The select committee report will look at school choice - and Mr Danks said grammar schools offered parents one of the few authentic choices in type of school. For many parents, "choosing" a place for their children in successful mainstream schools was a myth, he said, because sought-after schools were often heavily over-subscribed. Instead they were allocated a school which had places available. But Mr Danks said grammar schools offered a real choice to parents who had an academically able child. And he said grammar schools could be seen as part of the growing diversity within the state sector - specialising in pupils with an academic aptitude, as some specialist schools provide places for pupils with an aptitude for music or sport. Grammar schools, though small in number, have proved a politically sensitive subject, with left-wingers pursuing their abolition and Conservatives arguing for their retention. But the Labour government, elected in 1997, has avoided getting dragged into confrontations over selection. It has said it does not want to see selection extended, and introduced the current regulations - but anti-grammar campaigners have had little success in holding ballots. Defenders of selection say this is because there is little grassroots feeling against grammar schools - but opponents say it is because the ballot system is too complex and does not fairly test local opinion. There are now more pupils in grammar schools than there were when Labour came to power, because the schools have expanded. But grammar schools are less likely than non-selective schools to benefit from future government backing for popular schools to expand. Under the government's five-year plan for education, popular schools which have a strong demand for places will be helped to expand. But this "strong presumption" in favour of expansion will not be extended to grammar schools, if they submit plans to local school organisation committees. "While not excluded from the process, grammar schools are unlikely to benefit from the proposals to help good schools expand outlined in the five year plan," said a spokesperson for the Department for Education and Skills.